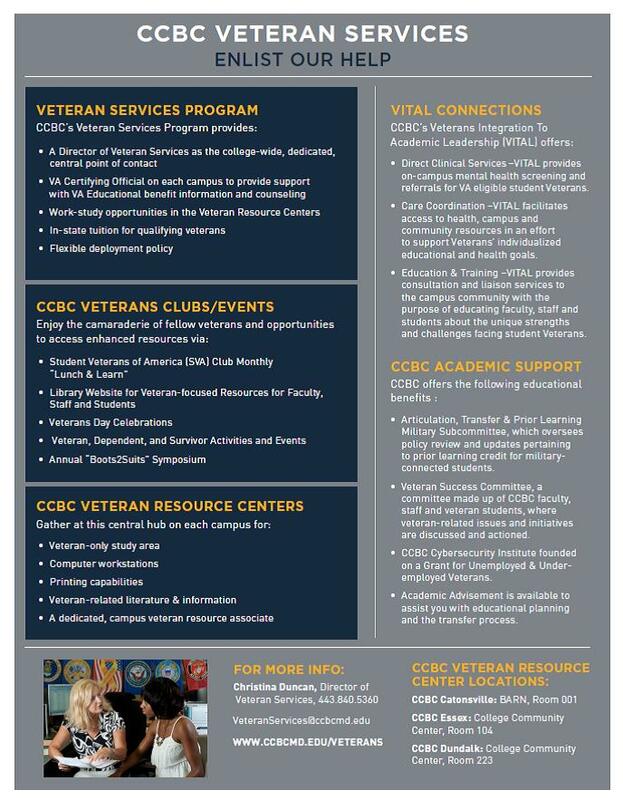 Resources for, by, or about veterans of interest to student veterans, current military and their families as well as all other interested students, faculty and staff at CCBC. FREE SANDWICHES AT MISSION BBQ FOR ARMED FORCES DAY: Mission BBQ is celebrating Armed Forces Day by honoring active duty members and vets for the entire week. Today, Mission BBQ is celebrating the Coast Guards. On Saturday, May 20, join Misson BBQ for 'Lunch with the Heroes' from 11 AM to 2 PM. For more information, click here. VETERAN SERVICES' GRADUATION AND HONORS LUNCHEON: The Veterans and Military-Connected Students of the Class of 2017 are invited to join us for a Graduation Luncheon, May 25, 2017, from 11:00 AM to 2:00 PM at The Barn, Room 001. For more information, click here. COLD WAR RECOGNITION CERTIFICATE ELIGIBILITY AND APPLICATION PROCESS: If you have faithfully served the United States during the Cold War era, September 2, 1945, to December 26, 1991, you may eligible for the COLD War Recognition Certificate. For more information, click here. CCBC SUMMER/FALL 2017 WELLNESS DISCOUNTS FOR A WIDE VARIETY OF ACTIVITIES: Take advantage of the CCBC discounts to a host of venues and activities. For more information, click here. ‘SHARK TANK’-STYLE COMPETITION AIMS TO HELP SOLVE PROBLEMS IN THE VA: The Department of Veterans Affairs is looking to its employees for new ideas to combat its oldest and biggest challenges, and it will screen potential solutions in a competition similar to the ABC reality show “Shark Tank.” To read this article in its entirety, click here. US DEPARTMENT OF VETERANS AFFAIRS CWV - NEWS UPDATE: The US Department of Veteran Affairs provided updates and news as of the week of May 17. Click here to view. VETERAN SERVICES: LUNCH & LEARN- ENTREPRENEURSHIP: Join us May 24, 2017, for our lunch and learn session on the Benefits of Entrepreneurship; industry trends for entrepreneurs; and programs and resources. For more information, click here. WALKING FOR THOSE WHO SERVE: 5K/10K Walk/Run: Join the Baltimore County Delta Foundation on Saturday, June 3 at 7:30 AM (for registration) for 5K/10K Walk/Run for Military and Veteran Women. For more information, click here. HOWARD COUNTY VETERANS FOUNDATION’S SITE DEDICATION: Save the Date and Join The Howard County Veterans Foundation, Inc. for the Site Dedication of The Howard County Veterans Monument on June 3, 2017, at 11 AM (rain or shine) at the Lakefront in Columbia, 10275 Little Patuxent Pkwy, Columbia, MD 21044. For more information, click here. PEFT ADVENTURE CHALLENGE: PEFT Adventure Challenge is an exciting 3- credit general education blended course that combines face-to-face meetings with on-line session. For more information, on the Essex Campus Summer 2017 session click here. Click here for the Essex Fall Session. Click here for the Dundalk Fall session. COLLEGE SCHOLARSHIPS: There are scholarships available for both students wishing to attend traditional colleges and students of all ages interested in enrolling in vocational, technical, and career schools. Click here to visit the website. Among the many valuable resources on the site are free scholarship searches which lists 70 no-cost scholarship search sites for students interested in all forms of post-secondary education. Click here to view. VETERANS TO FARMERS TRAINING: For more information on developing your Organic Farm, click here. RACIAL DIFFERENCES IN MENTAL HEALTH RECOVERY AMONG VETERANS WITH SERIOUS MENTAL ILLNESS: Black consumers with serious mental illness (SMI) face significant challenges in obtaining quality mental health care and are at risk for experiencing significant disparities in mental health care outcomes, including recovery from mental illness. To read this article in its entirety, click here. PAIN, PAIN, GO AWAY: IMPROVING CARE AND SAFETY WHEN MANAGING PAIN: You’re in pain, and it’s not going away. You go to your doctor wondering if there’s a way to relieve it, and you rest easy knowing you’re in good hands. With patient safety as a top priority, the Department of Defense and Department of Veterans Affairs have updated their clinical guidance on opioid therapy used to manage chronic pain. To read this article in its entirety, click here. INNOVATIVE SCANNER DESIGNED TO SAVE MARINES' LIVES ON THE BATTLEFIELD: Marine Corps Systems Command is bringing innovative, life-saving and award-winning technology to Marines on the front line. To read this article in its entirety, click here. A CAREGIVER'S QUIET RESILIENCE: As a wife, mother, and caregiver, Jen has her hands full. Never did she imagine she would be caring for a family of eight, including four children and two dogs, while traveling regularly to Paralympic-level adaptive sports training camps and clinics with an ill Service member. To read this article in its entirety, click here. DOD BRAIN INJURY CENTER OPENS MORE SITES FOR MILITARY TBI CARE: The Defense and Veterans Brain Injury Center (DVBIC) recently added traumatic brain injury (TBI) network sites at Fort Gordon, Georgia; Fort Drum, New York; and at the South Texas Veterans Health Care System in San Antonio. These sites help DVBIC spread the word among the military community about the latest in TBI research and treatment according to DVBIC deputy director Katherine Helmick. To read this article in its entirety, click here. VA REACH VET INITIATIVE HELPS SAVE VETERANS LIVES: Suicide prevention is on the Department of Veterans Affairs' (VA) highest priorities. As part of VA's commitment to put resources, services and all technology available to reduce Veteran suicide, VA has launched an innovative program call Recovery Engagement and Coordination for Health- Veterans Enhanced Treatment (REACH VET). To read this Press Release in its entirety, click here. WOMEN VETERANS: HELP FOR POSTPARTUM DEPRESSION: The birth of a baby is a life-changing event that can trigger all kinds of emotions from happiness and joy to jitters and fear. It can also lead to something you might not expect — postpartum depression. To read this article in its entirety, click here. BLS DATA - APRIL 2017: The BLS Employment Statistics were recently released. To review the monthly ‘cheat sheet,’ click here. The national unemployment rate for April 2017 decreased slightly from 4.5% to 4.4% and the Veteran unemployment numbers for April 2017 decreased from 3.9% to 3.7%. JOB VACANCY ANNOUNCEMENT- TEXAS VETERANS COMMISSION: There is a Veteran Education Program Specialist open. For more information about the position, click here. CDL A OR B DRIVER NEEDED IMMEDIATELY: Orange Cans, Elkton, MD needs a CDL A or B Driver immediately. Some experience is preferred. Good driving record and work record required. If interested, please send me your resume to: Roslyn Jones, Regional Veteran Employment Representative, Division of Workforce Development and Adult Learning, Maryland Department of Labor, Licensing & Regulation, 3637 Offut Road, Randallstown, MD 21133, roslyn.jones@maryland.gov. CAMPUS SECURITY POSITIONS AVAILABLE AT JOHNS HOPKINS: Johns Hopkins has multiple positions for Campus Security and want to hire veterans. To apply for this position, send your resume to: Roslyn Jones, Regional Veteran Employment Representative, Division of Workforce Development and Adult Learning, Maryland Department of Labor, Licensing & Regulation, 3637 Offut Road, Randallstown, MD 21133, roslyn.jones@maryland.gov. Click here to view the job description. VETERANS JOB FAIR- MAY 23, 2017: This job is open to all active duty, retired, former service, Reserve/National Guard service members and their families. For more information, click here. FORT MEADE COMMUNITY JOB FAIR, MAY 24: Make plans to attend the Fort Meade Community Job Fair on May 24, 2017, from 9 AM to 2 PM. For more information, click here. AJC LIBERTY CENTER HIRING EVENT – JUNE 9, 2017, AT THE RANDALLSTOWN CENTER: Make plans to attend a Job Fair on June 9 from 10 AM to 1:30 PM at the Randallstown Liberty Center, 3637 Offut Road, Randallstown, MD 21133. Click here to review the list of employers. Click here to view the flyer. WAY STATION’S RECRUITMENT EVENT: Way Station, Inc. is seeking bright, compassionate, hardworking and dedicated staff to support people with intellectual disabilities and/or mental illness. For more information on the Recruitment Event, click here. COMFORT KEEPERS’ RECRUITING EVENT: Make plans to attend the Recruiting Event at BERC on Wednesday, May 31, 2017, from 10 AM to 1 PM. For more information, click here. MARYLAND VETERANS AFFAIRS ANNOUNCEMENT 20170519: The MDVA's announcements and job postings for the week of May 19, 2017. Click here to view. Veteran Resource Associates (VRA) serve as the first stop for military-connected students seeking academic, wellness and military-related resources. 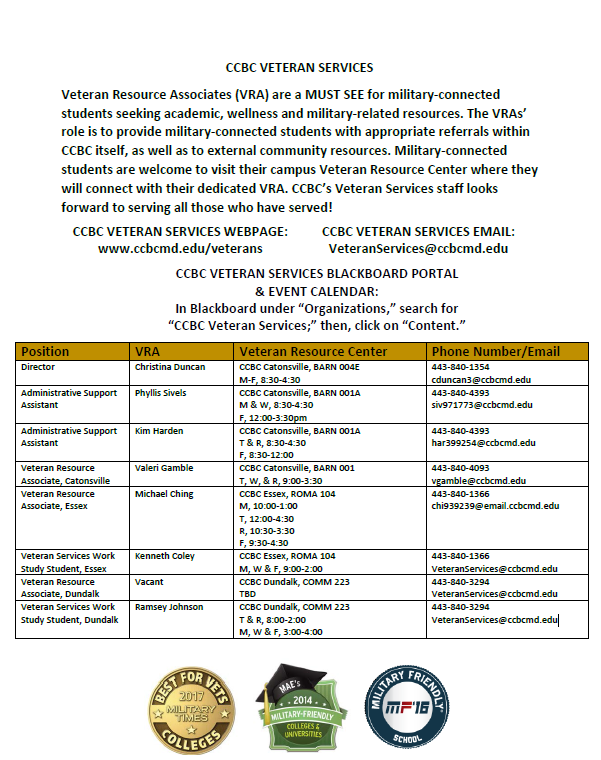 The VRAs’ role is to provide military-connected students with appropriate referrals within CCBC itself, as well as with external community resources. Military-connected students are welcome to visit their campus’ Veteran Resource Center where they will connect with their dedicated VRA. CCBC’s Veteran Services staff looks forward to serving all those who have served! 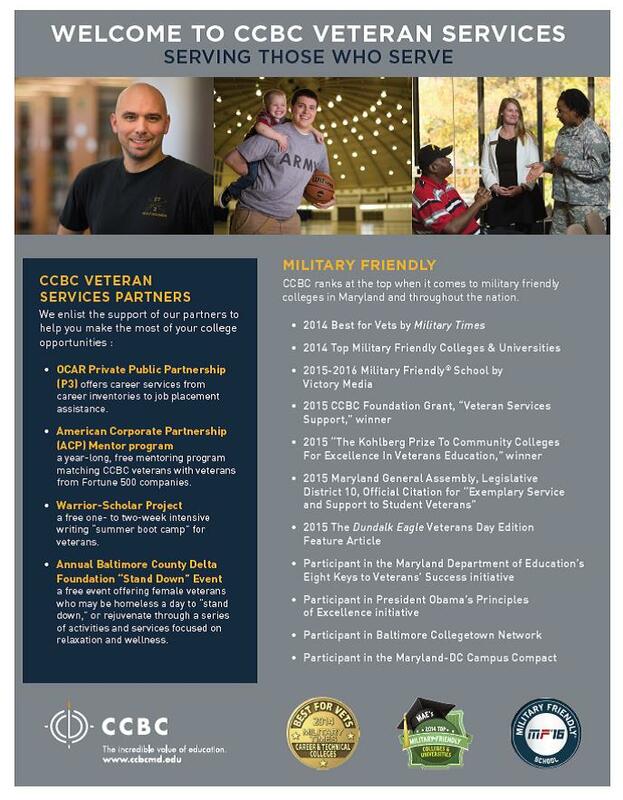 Check out CCBC Veterans in the news! WBAL TV broadcast covered the mentoring program from American Corporate Partners being introduced to the Community College of Baltimore County. The idea is to give veterans who are making their way through college an inside track into Fortune 500 companies.